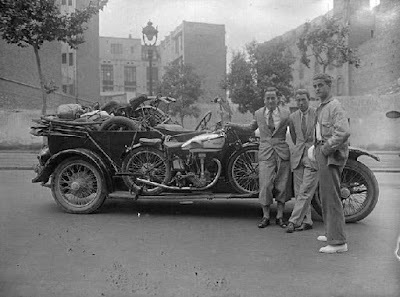 The model on the running board seems to be an early thirties International - still with Sturmey Archer footchange gear box and Dance knee grips on the tank. Several people have commented (and many thanks for that) that this is the Spanish rider Fernando Aranda on the way to the Italian GP. Inside the car is a KTT MK IV. He won in Italy with the 350 cc race with the Velocette. The next race was the German GP in Sachsenring where was seriously injured. After 8 month in German hospital he had to finish his career.